A private drive to Ravine’s Edge stone and stucco exterior create a striking appearance. 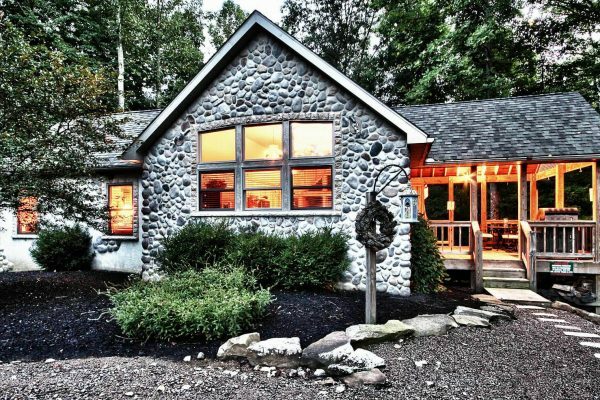 The cabin rests against a dedicated and protected habitat and is surrounded on three sides by heavily forested deep ravines, which creates a serene and private setting. Gas-log fireplace. Indoor fireplaces are a seasonal amenity and only available for use after Labor Day and before Memorial Day. Thank you for your understanding. Custom designed kitchen with stainless appliances, maple cabinetry and quartz counter tops. Large bedroom suite with king size bed and pillow top mattress. 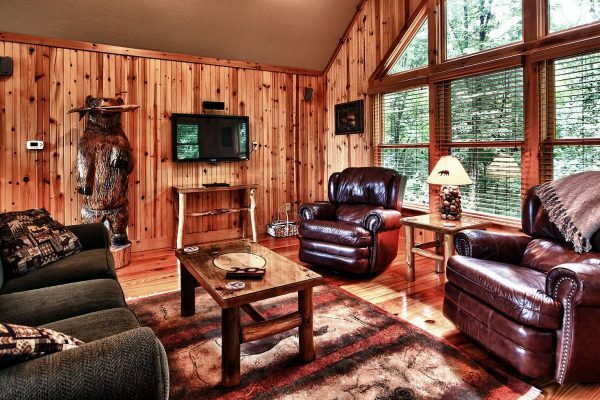 The Porch at Ravine’s Edge invites guests to enter and includes recessed lighting, ceiling fan, dining table with four-cushioned captain’s chairs and deluxe stainless steel barbeque grill (propane included). The interior features warm wide-plank wood floors, vaulted ceilings and large expanses of glass which provide a very open spacious experience throughout. 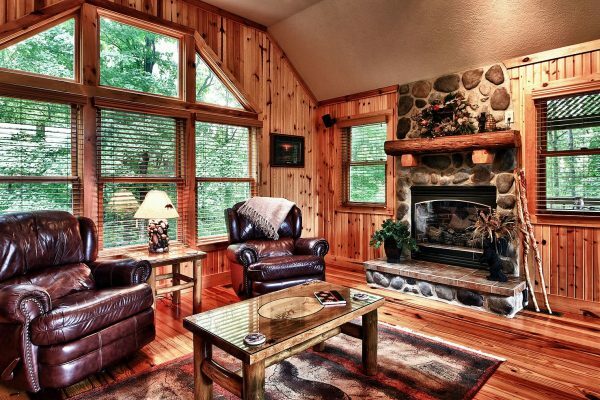 Leather chairs that recline and swivel, comfy sofa and a Lenox Elite gas log fireplace combine to create a comfortable and relaxing environment. 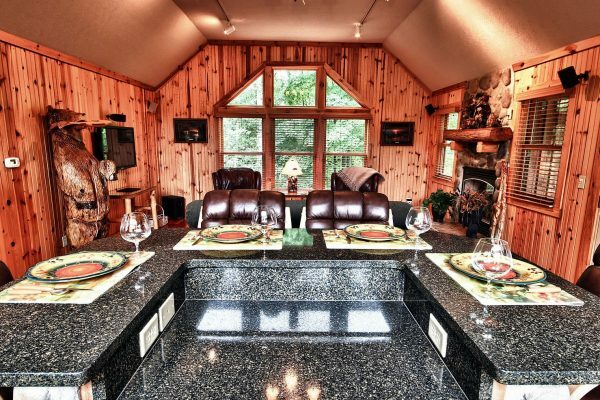 The fabulous Kitchen will satisfy the true gourmet with state-of-the-art stainless appliances with wine storage. Accessories include: coffee maker and grinder, blender, food processor and stainless cookery. Custom lighting highlights every room and sets the stage for the dramatic mood around every corner you turn. Tastefully designed with a beautiful two-tiered quartz and stone island bar and quartz counters, the kitchen opens magnificently into the living room. 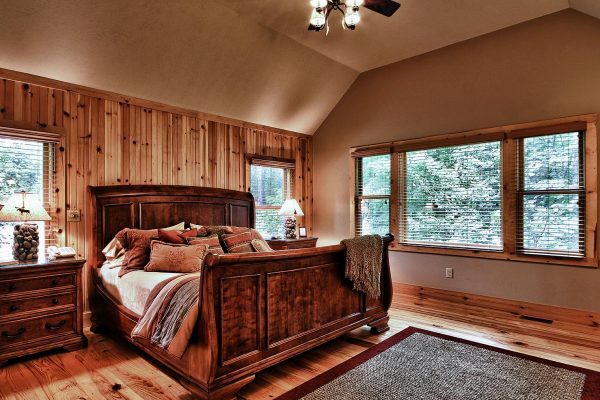 The spacious bedroom suite with dramatic woodland views includes king size sleigh bed with the most comfortable mattress you will ever sleep on and his and her closets. A 10′ wide vaulted opening from the bedroom faces a dramatic 2-person shower in the center of the bathroom suite. An immense 6′ x 6′ custom glass shower features 2 high-volume rain-maker shower heads that hang from an 11 1/2′ ceiling. 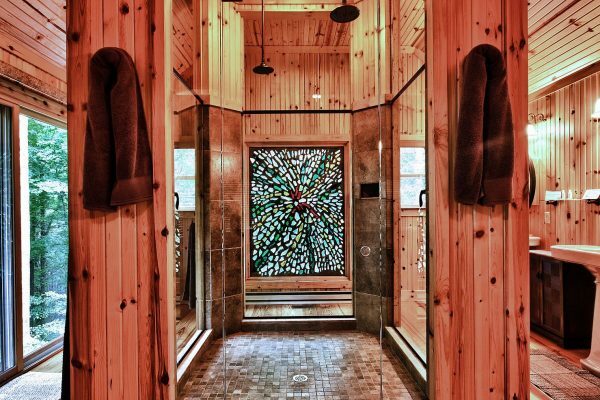 The backdrop for this gorgeous shower is a Foltz inspired (renowned Ohio sculptor) 6′ tall stained glass window. At night the window may be illuminated from the outside and is controlled with a dimmer switch located next to the bed. 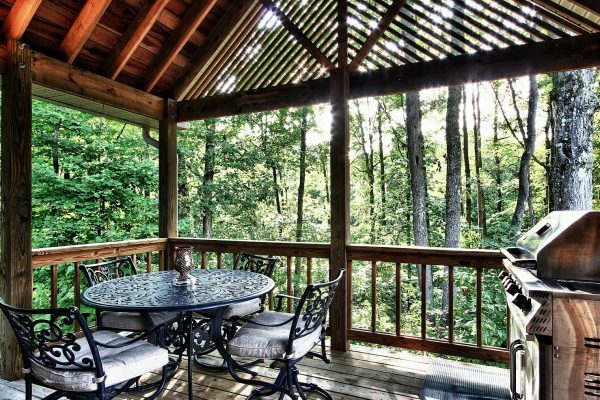 A private gazebo and hot tub are adjacent the bathroom suite and are carefully positioned at the edge of a heavily forested ravine. End your day with a soak in your Hot Springs hot tub while gazing up at the star-studded black sky and you’ll feel you’ve completed your own quest for relaxation and renewal. Great outdoor living includes your own fire pit (wood is available for sale) with Adirondack chairs.